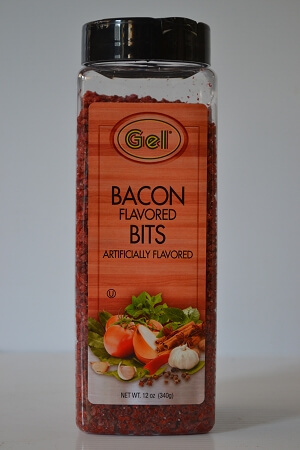 A flavorful addition to salads, dips, and spreads without the cholesterol of real bacon. Soy Flour, Soy Bean Oil, Salt, Less Than 2% of Hydrolyzed Soy Protein, Yeast Extract, Natural Smoke Flavor, Sunflower Oil, Sugar, Dextrose, Inactive Dried Yeast, Caramel Color, Red #3, Hydrolyzed Soy and Corn Protein, Soy Lecithin, and Natural Flavor. Contains Soy. Serving Size: 7g, Amount Per Serving: Calories 30, Total Fat 0.5g (1% DV), Sodium 120mg (5% DV), Total Carbohydrate 2g (1% DV), Protein 3g, Dietary Fiber 1g (4% DV), Calcium 20mg (2% DV), Potassium 150mg (4% DV). Percent Daily Values (DV) are based on a 2,000 calorie diet.